Our porterhouse steaks are the perfect steakhouse combination of NY strip and tenderloin rolled into one thick-cut monster. This bone-in steak is great when you want to impress friends or in-laws. Sear it hard and fast, and finish it in the oven. The most tender steak works great as a quick sear finished in browned butter with thyme and garlic. This boneless steakhouse cut has the full flavor and juiciness of a ribeye but much leaner. Our never-fail marinade for the perfect grilled steak is a mixture of equal parts olive oil, balsamic vinegar, Worcestershire sauce and soy sauce, mixed with a spoonful of Dijon and minced garlic, with salt and pepper to taste. Grill this classic bone-in cut to a medium rare with generous amounts of salt and pepper. Serve with grilled leeks and portobello caps. The difference between this cut and the porterhouse is the size of the tenderloin and NY strip steaks. If you love NY strip, then this is the way to go! 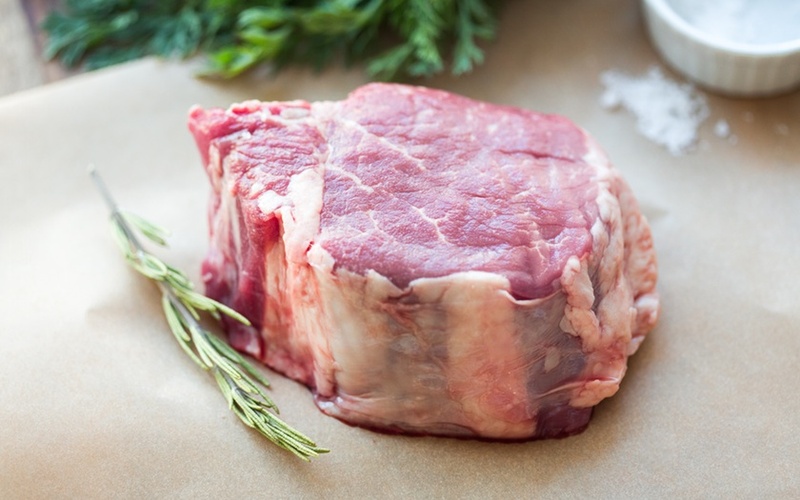 Our boneless ribeye steak is a very flavorful, tender and well-marbled searing steak that doesn't need anything but salt and pepper (and maybe some lemony grilled asparagus! Loose-grained and awesome flavor makes this a favorite for grilling on an open flame or searing up with a quick lime marinade and an anchovy and shallot jus. A fantastic steak for marinating and grilling up for a small party. Our old time classic is throwing some italian dressing on it for an hour and then finishing it off over some hot coals. A great alternative to filet mignon. This guy is much fuller in flavor and will change the minds of any tenderloin lovers. This flavorful steak comes from Brazil where it is called Picanha. It's cooked on a rotisserie while it bastes in its own juices and then sliced off the skewer at the tables of Churrascarias throughout the country. Even if you don't have a rotisserie in your kitchen, cooking this on low with the fat cap down lets the juices render out for basting and a high heat finish will give it a beautiful char. 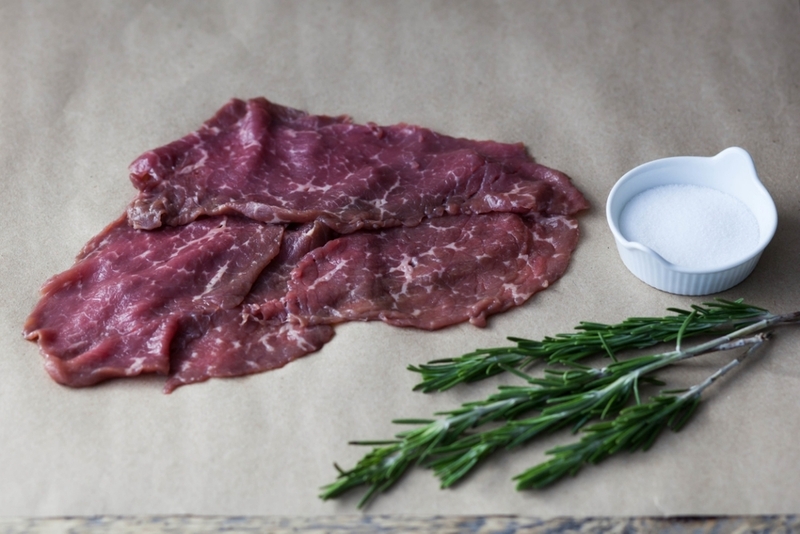 A thicker cousin of the skirt steak, this loose-grained cut is becoming a popular option among chefs where you'll see it on NYC menus as "Bavette Steak". It great for marinating, grilling and stir frying. Just make sure you cut against the prominent grain when carving. 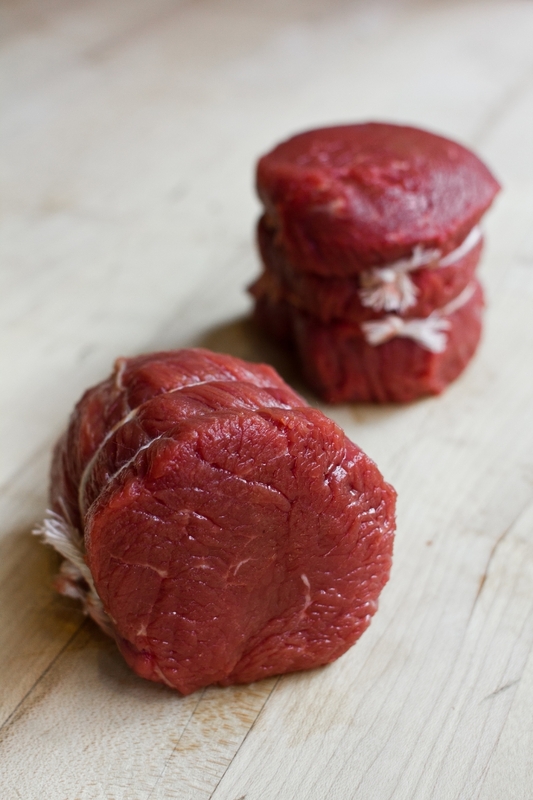 The Tip Filet is a quick and easy lean medallion that is great as a substitute for Filet Mignon. This versatile steak has the highest amount of marbling of any steak. It works great on the grill, seared in a pan or braised until falling apart and delicious. 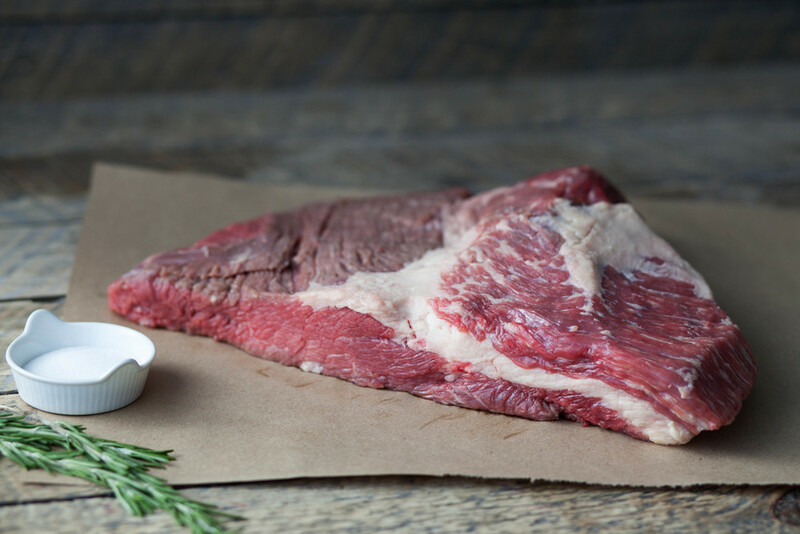 Often called the "Poor Man's Ribeye", the Chuckeye Steak contains the same muscles as a Ribeye and is a great value for its flavor and juiciness. They also moonlight as a great braising option if you decide the weather calls for a stew instead of a steak. Thinly-sliced strips ready for a marinade and then quick sear in the wok. Perfect for quick dinners. The perfect steakhouse combination of NY strip and tenderloin rolled into one thick-cut monster. This bone-in steak is great when you want to impress friends or in-laws. Sear it hard and fast, and finish it in the oven. Grill this classic bone-in cut to a medium rare with generous amounts of salt and pepper. Serve with grilled leeks and portobello caps. The difference between this cut and the porterhouse is the size of the tenderloin and NY strip. If you love NY strip, then this is the way to go! A flavorful, tender and well-marbled searing steak that doesn't need anything but salt and pepper. One of our favorite cuts. It has a ton of flavor and is well-marbled. Just throw it in a smoky, spicy dry rub and grill over medium high heat until beautifully charred. The second most tender steak is an anomaly. A full-flavored lean cut from the chuck that is awesome seared on high with just salt. Called the butcher's steak for a reason. There's only one hanger on each steer and its got a ton of flavor. Loose-grained and great served medium-rare but just make sure to slice it against the grain. Perfectly portioned for one. This steak is the third most tender and great in a hot pan or sous-vide. This flavorful steak is a favorite in Brazil. Cooked on a rotisserie while it bastes in its own juices and then sliced off the skewer at the tables of Churrascarias throughout the country. Cook high and mind the grain. A favorite on the West Coast. 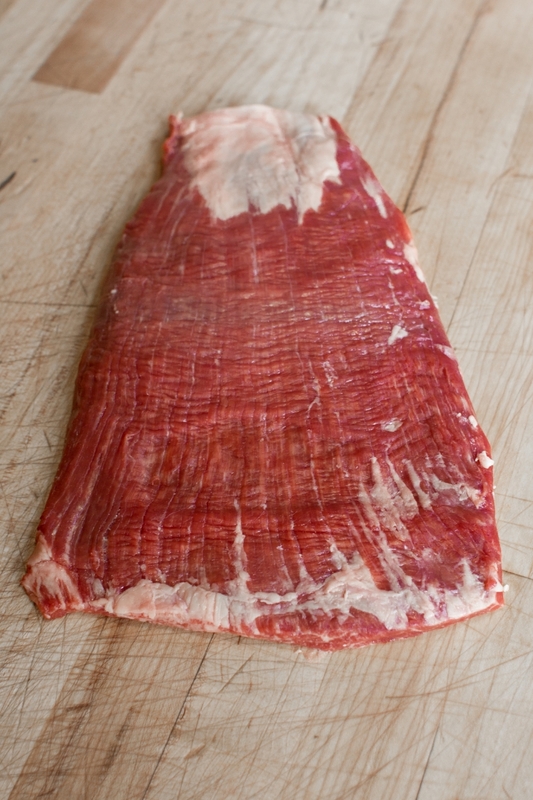 This cut is great covered in a Santa Maria rub and roasted fast for carne asada. Brisket benefits from low and slow cooking, so braise this cut in a slow cooker for several hours for meltingly tender, fall-apart meat! Great for stews and soups. Beef (not Ox!) only have one oxtail so it is always in high demand because of it's rich, full-flavor and the body that it adds to any stock. The boneless version of Osso Buco, this is a great lean option for braising that always returns delicious fall apart stew with full-bodied stock. Brine it and braise It. The tongue has its dedicated followers for its unique flavor and texture. Works well sliced for sandwiches or pulled for tacos de lengua. This flavorful cut is a favorite in Brazil. It's cooked on a rotisserie while it bastes in its own juices and then sliced off the skewer at the tables of Churrascarias throughout the country. Even if you don't have a rotisserie in your kitchen, cooking this on low with the fat cap down lets the juices render out for basting and a high heat finish will give it a beautiful char. Your grandfather's Roast Beef. Sliced thinly, this full-flavored cut is a great option for a dinner party and leftover steak sandwiches. Traditional American Pot Roast cut. This is a lean cut from the Bottom Round that can be used either for thinly sliced roast beef or slow braised beef and stew recipes. This is the classic holiday prime rib roast. Perfect for impressing and feeding your family at your holiday dinner table. Also known as Beef Back Ribs, one of our butcher friends calls these guys "beef butter". They are the equivalent to Baby Back Ribs and come from the prime rib so they have a ton of flavor and are great slow roasted in a low temp oven. Lightly smoky with a perfect snap, our Hot Dogs will remind you of family cookouts in the summer. Cajun spiced. Perfect for gumbos and stews or just making a piquant sausage sandwich. Cumin, cayenne and garlic give an awesome kick to tacos, sandwiches or huevos rancheros. Or grill it whole and serve with fire-roasted poblanos and onions. This western Pennsylvania classic is hard to find these days but pulls in many converts once they try it. Fully cooked and ready to eat with an 1.25" diameter for a nice medium-sized slice. Fry it up, or eat it cold on a sandwich with cheddar. This Polish favorite is fresh and great when served with sauted sauerkraut, pickles, rye bread and a nice grainy mustard. Saute in olive oil with peppers, onions, tomato paste and fresh herbs, and serve on crusty Italian hoagies for an easy weeknight dinner. Charcoal + matches + our 1/4 lb 100% grass-fed patties = the easiest BBQ you'll have this summer. No prep necessary. These guys are great for throwing an impromptu party or if you only want a quick lunch in the hot weather! Well-marbled (about 80/20 meat-to-fat ratio) and very flavorful, this ground beef is excellent for burgers, meatballs and tacos. Well-marbled (about 80/20 meat-to-fat ratio) and very flavorful, these 1/4 lb. patties are excellent for burgers or keeping your portion sizes small. The most nutritious cut there is to be had. Brown thin slices in butter with crisp sage and caramelized onions. An intensely flavored cut that works well in steak and kidney pie. Soaking in milk can help to mellow the flavor. Roast in the oven at 425 F for 20 minutes and you have a delicious spread for a baguette. Finish with some salt and serve with a parsley salad and lemon vinagrette to cut the rich marrow. These bones are rich in collagen and marrow. They are great as the basis for a stock or bone broth. Combined with neck bones and roasted beforehand, the stock's deep flavor and body are unparalleled.